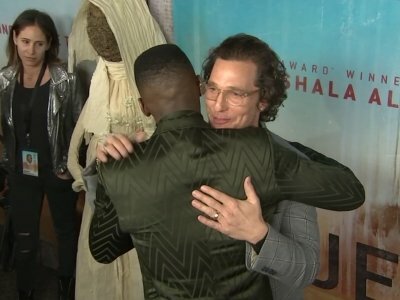 NEW YORK (AP) — Matthew McConaughey notched one of the worst debuts of his career, Oscar nominees saw only modest bumps and M. Night Shyamalan's "Glass" easily remained No. 1 on a quiet weekend in movie theaters. The weekend's two new wide releases — McConaughey's tropic noir "Serenity" and the updated King Arthur tale "The Kid Who Would Be King" — both flopped with moviegoers who instead continued to flock to "Glass" and Kevin Hart's "The Upside." NEW YORK (AP) — Harmony Korine's "The Beach Bum," Olivia Wilde's directorial debut and a documentary on the breakout campaign of Texas politician Beto O'Rourke will premiere at the annual South by Southwest Film Festival. HOUSTON (AP) — Firefighters, police officers and 911 operators in Texas got a surprise lunch from a famous son as Oscar-winner Matthew McConaughey showed up with roasted turkey to give thanks on National First Responders Day. The actor's appearance and catered lunch Sunday shocked those at a Houston fire department. Later, he did the same for police officers and 911 operators at other facilities. Nov. 4: Actress Loretta Swit ("M.A.S.H.") is 81. Singer Harry Elston of Friends of Distinction is 80. Singer Delbert McClinton is 78. Actress Ivonne Coll ("Jane the Virgin") is 71. Actress Markie Post is 68. Singer-guitarist Chris Difford of Squeeze is 64. Country singer Kim Forester of the Forester Sisters is 58. Actress Kathy Griffin is 58. Actor Ralph Macchio is 57. "Survivor" host Jeff Probst is 57. Actor Matthew McConaughey is 49. Rapper-producer Sean "Diddy" Combs is 49. TV personality Bethenny Frankel ("Bethenny," ''Real Housewives of New York") is 48. Singer Shawn Rivera of Az Yet is 47. Actress Heather Tom ("Bold and the Beautiful," ''One Life To Live") is 43. Actress Emme Rylan ("General Hospital") is 38. "The Nun" (Sept. 7) — A gothic supernatural horror film and spinoff in "The Conjuring" franchise. "The Predator (Sept. 14) — Shane Black's fourth installment in "The Predator" films, with Boyd Holbrook, Trevante Rhodes and Jacob Tremblay. "The Land of Steady Habits" (Sept. 14) — Ben Mendelsohn stars as a Connecticut divorcee in midlife crisis in Nicole Holofcener's adaptation of Ted Thompson's 2014 novel. LOS ANGELES (AP) — Reese Witherspoon, Mahershala Ali and Keith Urban are among the stars joining the sixth Stand Up To Cancer telethon. Matthew McConaughey has sent his love to Channing Tatum, following the star's split from wife Jenna Dewan. The 37-year-old actor called time on his nine-year marriage to Jenna earlier this month, and his close pal and fellow Hollywood star Matthew has said that whilst he hasn't had a chance to "check in" on Channing just yet, he knows the split must be hard on him. 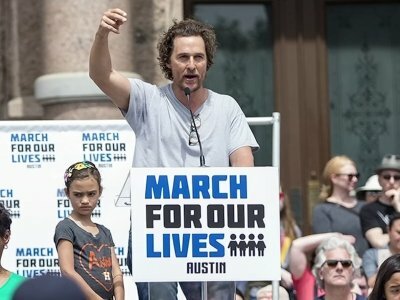 LAS VEGAS (AP) — A month after speaking at the March for Our Lives in his hometown of Austin, Texas, Matthew McConaughey says he supports some gun control but fears the youth-led movement could be "hijacked" by those hoping to eliminate all guns in the United States. McConaughey spoke about his support for the marchers on Monday in Las Vegas, where he was promoting his upcoming film, "White Boy Rick," at the CinemaCon theater-owners convention. He called gun violence "an epidemic in our country." CLEVELAND, Ohio -- The release of filmed-in-Cleveland "White Boy Rick" has been delayed a month. The 1980s crime drama starring Matthew McConaughey will now arrives in theaters on Sept. 21. The film was previously scheduled to be released on August 17. It was hard to find but worth the lookin' for. I don't know who first said that. In such a situation, I usually just assume it was Matthew McConaughey. Regardless, it perfectly sums up the Pitt basketball coaching search. Dan Hurley said, "No thanks." Tom Crean leveraged Pitt for a gig he wanted more at Georgia. Thad Matta might not feel healthy yet. Sean Miller, Nate Oats and Mark Schmidt publicly acted disinterested. Jon Scheyer was rumored. Matthew McConaughey is thankful his wife doesn't want to "change" him. The 'Interstellar' star has admitted he's grateful for his life, his spouse Camila Alves and their three children Levi, nine, Vida, eight, and Livingston, five. During a Q&A with Ryan Long, he said when asked what he's most thankful for: "My life, three healthy children [and] my wife Camila who doesn't want to change me." 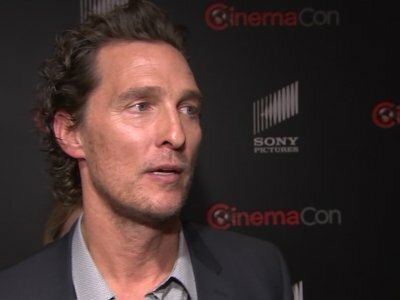 Pennsylvania State Police allege that a man claiming to be Oscar-winning actor Matthew McConaughey tried to steal a car over the weekend. The actor took out a full-page ad in the Austin American-Statesman on Sunday. It reads: "From one local to another, Congratulations Nick Foles. just keep livin, Matthew McConaughey." The Austin (Texas) American-Statesman ran a full-page ad purchased by a local resident after Nick Foles led the Philadelphia Eagles to win the Super Bowl. That resident was none other than Matthew McConaughey. Actor Matthew McConaughey is known for his support of all things Texan and on Sunday he took out a full page ad in the Austin Statesman to celebrate the success of another Lone Stater: Eagles Super Bowl winning quarterback Nick Foles. “From one local to another, Congratulations Nick Foles. 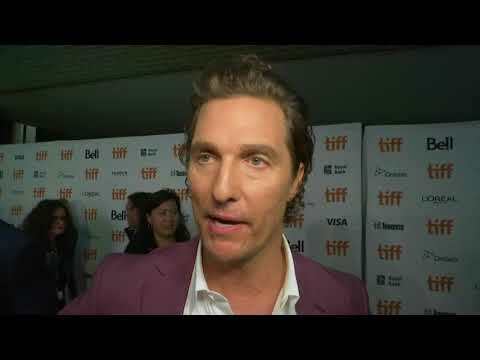 just keep livin, Matthew McConaughey,” the ad, featuriing a map of Texas, said. As Matthew McConaughey would say: All right, all right all right. The Lincoln Motor Co. spokesman would probably be pleased to hear the luxury carmaker's 2018 Navigator drove away with the highest honor in The Detroit News' annual Readers' Choice Awards. One hundred judges selected from the public voted the SUV as Best of Show as well as Best Road-Trip Ride at the Detroit auto show. Ford Motor Co. also took the prize for Best Dream Machine with its Ford GT. San Antonio’s own Randy “Master Blaster” Ricks has been a male dancer, entertaining tens of thousands of women with his trademark bump and grind for almost 37 years, which could just be a world record. 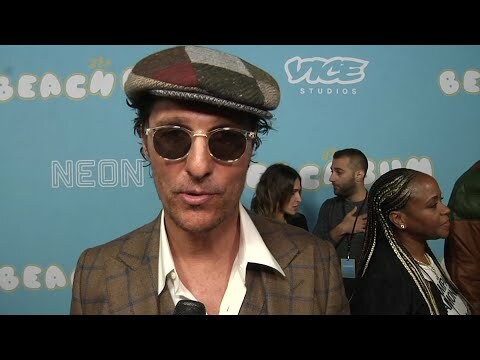 MIAMI (AP) — Myles Turner made almost every shot he took in Indiana's biggest win of the season, and even got a chance for a brief postgame chat with actor Matthew McConaughey. Everything went great for the Pacers. Everything went wrong for the Miami Heat. Bojan Bogdanovic scored 26 points, Turner added 25 on 11 of 14 shooting and the Pacers embarrassed the Heat in the second half on the way to a 120-95 rout Sunday night. ASHLAND — Bob Hart, 92, of Ashland, served in the U.S. Army Air Corps during World War II, but that couldn't prepare him for what happened a quarter of a century later. Hart was one of 12 survivors of the Nov. 20, 1967, Trans World Airlines Flight 128. It claimed 70 lives, and while it wasn't made into a movie starring Tom Hanks or Matthew McConaughey, it had more than its share of heroes, irony and tests of perseverance of the human spirit. If you're looking for a Razzie nominee for Worst Film of the Year, you might look at “The Dark Tower." Based on Stephen King's novels, it could make reading popular. So much is missing from the film you feel like you slipped away during an important part. Even worse? Matthew McConaughey is such a poor choice to play the Man in Black, you never quite buy his menace. TACOMA, Wash. (AP) — Famous actor Matthew McConaughey was spotted filming a Lincoln car commercial in Washington state. 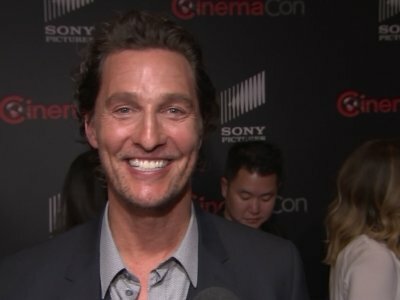 The News Tribune reports (http://bit.ly/2xzkPeb ) that McConaughey was in the city of Roy on Thursday. Roy resident Katy Burkett, who owns property near the film site, says she saw McConaughey with her own eyes. Organizers said the "Harvey Can't Mess With Texas" concert will be held in Austin on Sept. 22. It will be broadcast live on 11 Tegna stations in the state and on YouTube. PRINCESS ANNE, Md. (AP) — In 1986, "Violets are Blue," a movie about high school sweethearts rekindling their lost love, was filmed on location in Ocean City. Matthew McConaughey's "devilish quality" landed him his role in 'Dark Tower'. The Oscar-winning actor stars as the Man in Black, aka Walter Padick, in director Nikolaj Arcel's adaptation of Steven King's fantasy saga, and he had a great time playing a character who wasn't an "apologetic bad guy". Arcel said: "One of the first things I told the producers was I really wanted McConaughey to play the Man in Black because I was a fan. What’s playing in Aiken for the weekend of Aug. 11? A nun and several girls from a closed orphanage move in with the bereaved dollmaker, his wife and the possessed doll in this horror sequel. With Stephanie Sigman, Talitha Bateman, Anthony LaPaglia, Miranda Otto. Written by Gary Dauberman. Directed by David F. Sandberg. (1:49) R.
NEW YORK (AP) — Kathryn Bigelow's race-riots docudrama "Detroit" struggled to find a wide audience, while the poorly reviewed Stephen King adaptation "The Dark Tower" finally arrived to middling results. NEW YORK (AP) — After a decade of development and several postponements, the long-awaited Stephen King adaptation "The Dark Tower" debuted with an estimated $19.5 million in North American ticket sales, narrowly edging out the two-week leader "Dunkirk." The modest result for "The Dark Tower," starring Idris Elba and Matthew McConaughey, was in line with expectations heading into the weekend but well shy of initial hopes for a possible franchise-starter. Ah, August. It’s that time of year when you can head to your local multiplex to see Matthew McConaughey as an interplanetary David Copperfield who’s trying to use his “magics” to destroy a looming tower that protects the universe from ready-to-invade hordes of demons that linger just outside the universe. So, I guess, pretty far out there in space. Ah, August. It's that time of year when you can head to your local multiplex to see Matthew McConaughey as an interplanetary David Copperfield who's trying to use his "magics" to destroy a looming tower that protects the universe from ready-to-invade hordes of demons that linger just outside the universe. So, I guess, pretty far out there in space.